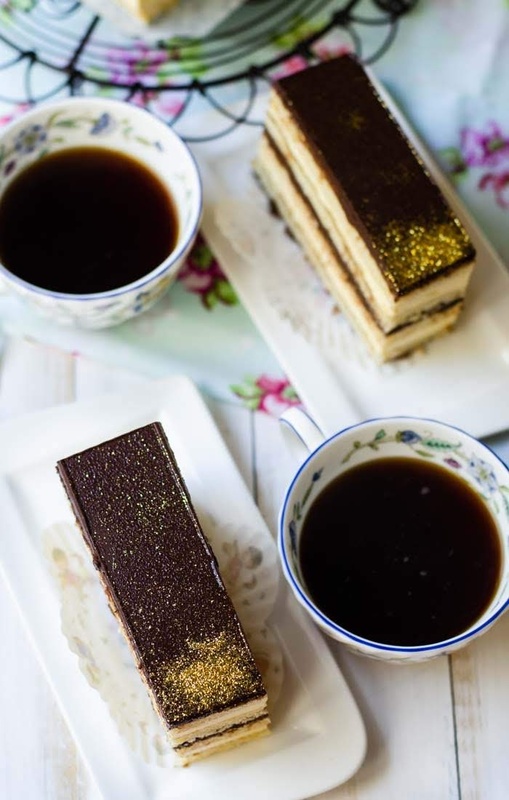 Opera cake is a French most loved dessert. 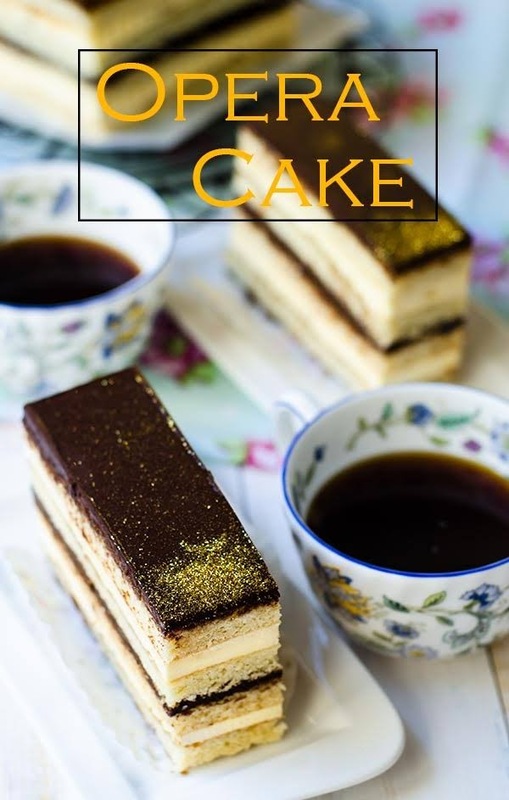 Opera cake consists of layers of almond sponge soaked in coffee syrup, chocolate buttercream, chocolate ganache and chocolate glaze. Its not easy finding a suitable birthday cake for my boy or boys in general. Cake has to be bold in colour and shape. Flavours ought to be strong. 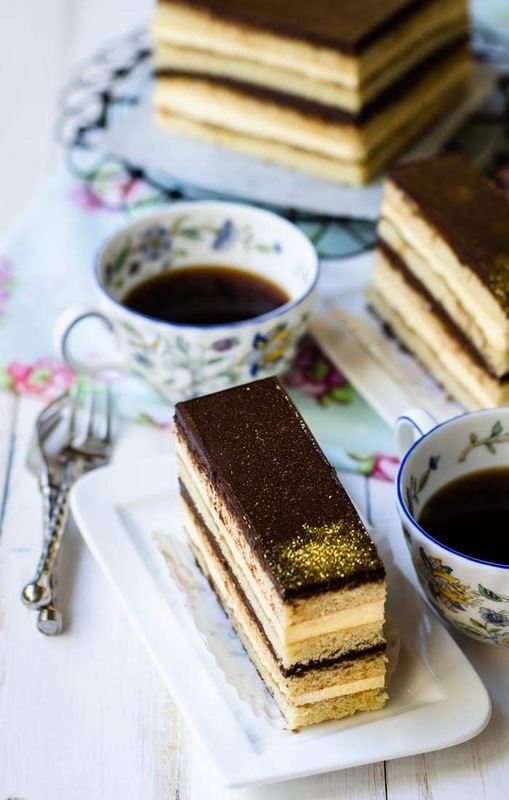 Its not just a cake, its an Opera Cake! After much research, being apprehensive of executing the task, I opted to bake my son, a French decadent, most loved dessert, an Opera Cake. Phew!!!! I can NOW take a breather. Thought this post will never make it to the blog. Oh why, the exclamation mark!!! ...because I just couldn't believe it either that he is TWENTY-One years of age!!! If I can have my way, I don't want them to grow at all, stay forever in a time capsule as a 1 or 2 year old... just not 21! Being 21 is a huge milestone for my baby 'insert buckets of tears here", and you deserved a special treat. and I have a few words to say to you. A special bake for that special someone, who filled my life with love, pride and joy (at times.. a pain in my **** too! it all comes in a package deal ;p) ~ Opera Cake. Reading Joe's Pastry blog, I was hooked and overwhelmed at the same time. 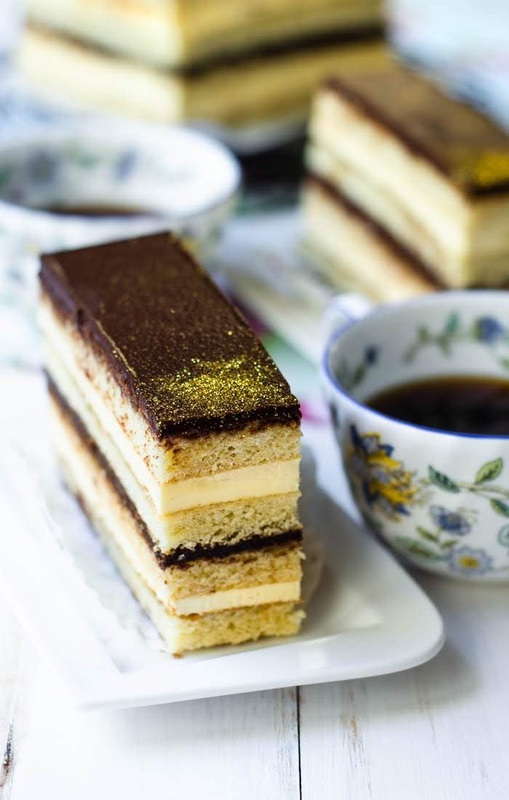 Baking Opera Cake seems like an elaborate, laborious cake to bake. I did have self doubt. "To bake or not to Bake?" "am I able to put it together?" Questions that went through my head over and over again. Took me at least a month to go through the steps, planning on what to do, how to execute and so forth, for this is the first time I am baking an Opera cake and certainly I do not wish to make any boo-boo. I tried to make the recipe as simple as possible. And if you spotted something amiss, please do give me shout. Would I bake this cake again? Line 2 Swiss roll pans with greaseproof baking paper. Transfer the meringue into another bowl. use paddle, mix almond meal, icing sugar and eggs on medium speed until light and increased in volume. on low speed , add flour and stir until flour just combined. add and fold in clarified butter. Divide the mixture into 2 swiss roll pans. Cover with another greaseproof paper, flip joconde upside down. Wrap in cling film, place on the Swiss roll pan again, refrigerate for use next day. Using stand mixer (or equivalent) whip egg yolk on high speed for 5 minutes or until light in color. Meanwhile, prepare sugar syrup, by combine water and sugar in saucepan. Must use sugar thermometer !!!! bring the syrup to 115 C / 238F. Remove from heat and drizzle into the whipped egg yolk in a thin stream while keeping the stand mixer running (so NOT to have the egg cooked ;p). Keep the stand mixer running on low speed (to avoid splatter). Change to paddle and add butter, piece at a time. Beat for few minutes until homogenous mixture is achieved and 'hangs' off the paddle/ beater . Add cream in another small saucepan and bring to boil. Place 2nd joconde on top. Place 4th layer and again brush (generously) coffee syrup. spread a thin layer of buttercream to create a smooth surface. refrigerate before trimming off the edges. Using a heatproof container (preferably that does not retain heat), break 80g dark chocolate into chunks. Check after 10 seconds and microwave again if required. When the chocolate has almost melt, add the remaining chocolate chunks and stir until all melted and smooth. Note : prepare a bowl of ice and a bowl of hot water if needed. When chocolate gets too hot, rest the heatproof container in ice-bowl to cool and vice versa. That's a great cake to celebrate the birthday! A belated birthday wish to one very lucky boy! Wow, this looks so good, I would love to make this. Unfortunately, I hate coffee. Do you have any suggestions how to substitute this? I was thinking about hot chocolate or almond syrup instead of coffee syrup. What do you think? ?